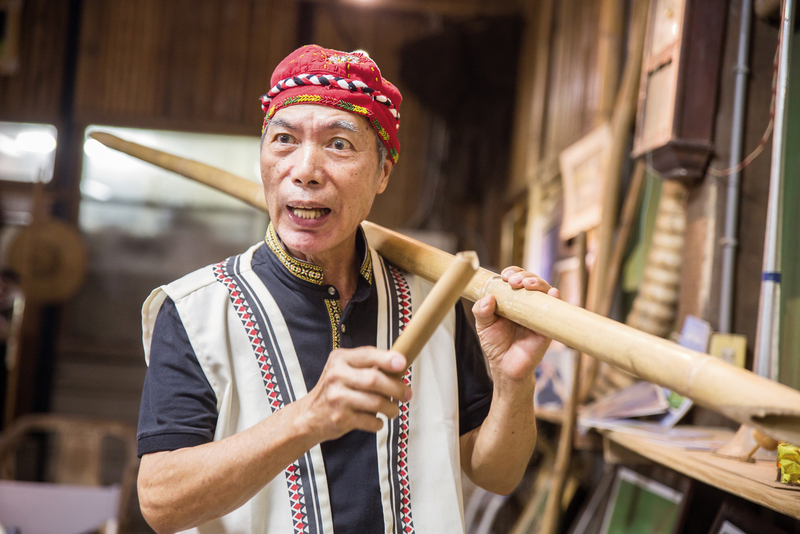 The Green Valley Siraya Park, at Jiu­ceng­ling in the Xin­hua District of Tai­nan City, is home to ­Cheng­-hiong­ Ta­la­van, founder of the Si­raya Culture Association. 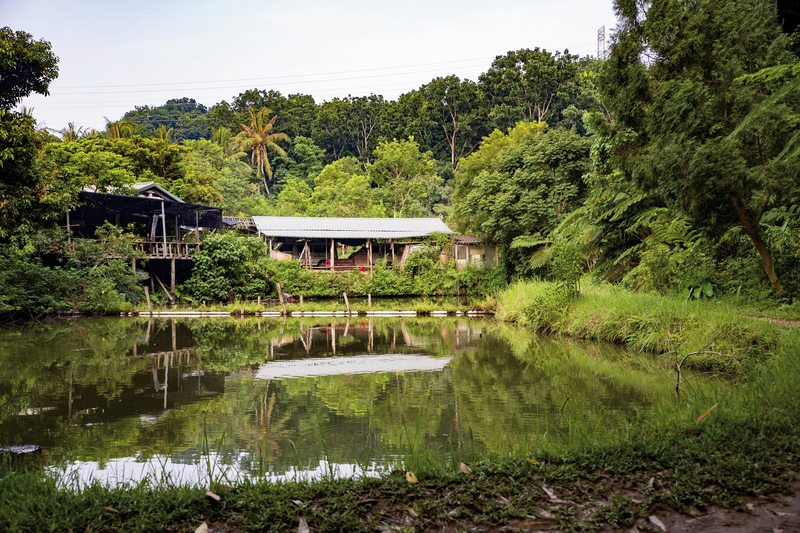 It is also the main base of the movement for the Si­raya to be officially recognized as one of Taiwan’s indigenous peoples. The park is nestled between mountains and water. Over the pond there is a simple floating bridge constructed out of water pipes and bamboo. The pond is quite deep, and as soon as you step on the bridge, it sinks by several centimeters, adding a sense of danger. We ask the Talavan family if we can take their picture on the bridge, and Cheng-hiong immediately agrees. Then the whole family step cautiously onto the bridge, with daughter Uma Talavan leading the way and grandchildren following grandparents as they all hold hands for a beautiful family portrait. On the pathway to revitalizing Sirayan culture, three generations of the Talavan family are working hand in hand, just like in the picture, for the same goals. 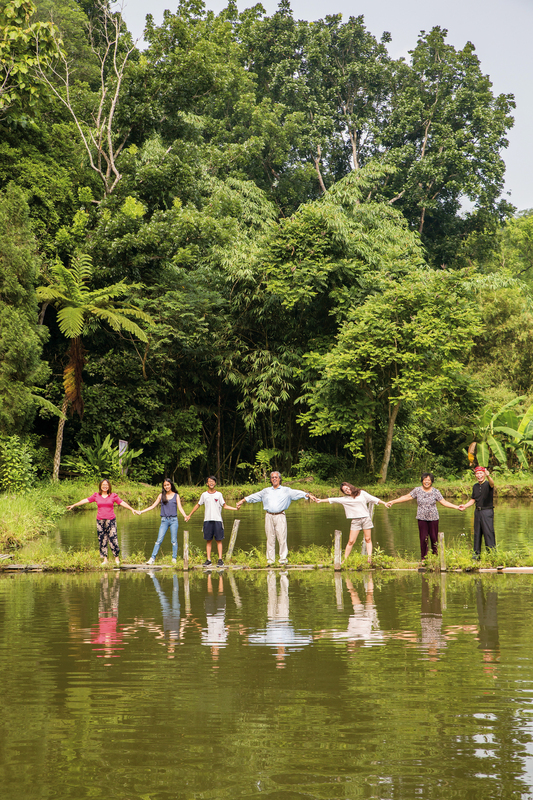 Cheng­-hiong­ Ta­la­van has spent his entire life encouraging the descendants of ­Pingpu Aborigines (who include the Si­raya) to awaken to a sense of their identity. His daughter Uma Ta­la­van and her husband Edgar Ma­ca­pili have devoted themselves to Si­ra­yan language and culture. His grandchildren Euphony and Lici Ta­la­van, together with other young people from the tribe, sent a letter to President Tsai Ing-wen appealing for recognition of the Si­raya name and identity. The three generations are working together to revitalize Si­ra­yan culture. Now aged 75, Cheng­-hiong­ Ta­la­van recalls being called a “savage” as a child. He didn’t understand what this term meant, and he asked about it repeatedly, until finally his uncle whispered in his ear, “‘Savages’ means the ­Pingpu!” Only after asking even more questions did ­Cheng-hiong­ learn that the ­Pingpu were Formosan Aboriginal peoples. The Si­raya are one of the ­Pingpu peoples. When the Dutch came to Taiwan in the 17th century, the Si­raya were the first people they encountered. But under a succession of foreign ruling powers, the Siraya were forcibly Sinicized, losing their traditional customs and language, until their very identity became obscured. Cheng-hiong says there is no sense in indigenous people accepting discrimination against them. Instead they should proudly be who they are. That is why at every gathering or occasion, he has long seized the opportunity to say to everyone, “We are savages,” reclaiming the term. One person lobbying and trying to wake up his tribespeople to their identity can only have a weak influence. ­Cheng-hiong­ therefore also devoted great efforts to forming the Si­raya Culture Association, drawing on collective power to revitalize Si­ra­yan culture. Cheng-hiong’s daughter Uma Ta­la­van is currently chairwoman of the Si­raya Culture Association. She was born and raised in the tribal community, so it was only after growing up and leaving the community that she discovered that her group was considered different. Her love of her homeland and her awakening to her identity caused her to realize that her memories of childhood represented the life she wanted. “So if there’s anything that feels awkward to me, or something that clashes, it makes me want to plunge right in and challenge it.” Thus does Uma describe her inspiration for and involvement in human rights and cultural movements. 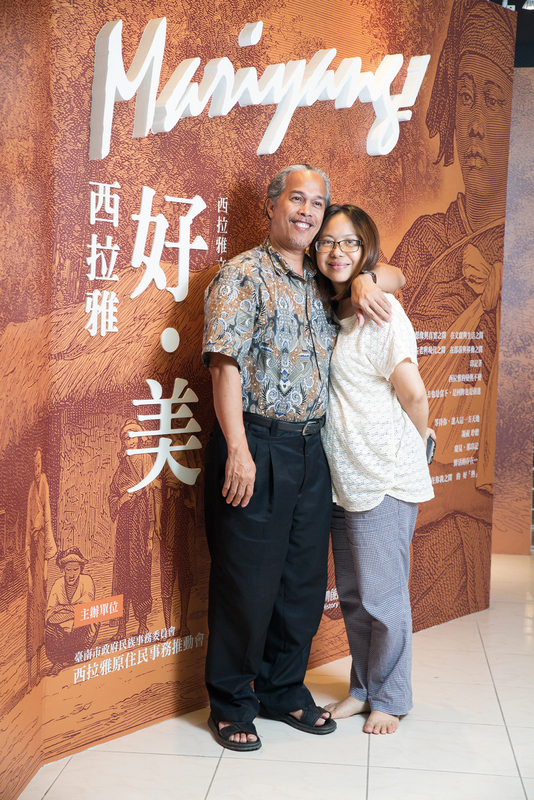 In going from feeling bewildered at being called a “savage” by Han Chinese to discovering his identity as an indigenous person, ­Cheng-hiong­ Ta­la­van also found out that he knew nothing at all about his culture. Even today, the S­ira­yan language is listed on the ­UNESCO website as an “extinct” tongue which has been gone for over 200 years, never being heard or spoken in that whole period of time. In their quest to recover Si­­raya linguistic culture, ­­Cheng-hiong­­ and Uma Ta­­la­­van searched everywhere to collect words and phrases in Sirayan from elders. But the results were very meager. The dramatic turning point came after they obtained a Si­rayan translation of the Gospel of St. Matthew, made by early Dutch missionaries. After ­Cheng-hiong­ had invested so much effort in the hope of opening the door to the Si­rayan language, amazingly the key to unlocking its secrets turned out to be his Filipino son-in-law, Edgar Ma­ca­pili. Originally a musician, Ma­ca­pili turned himself into a linguistics scholar. He compared texts in Dutch, English, Si­ra­yan, and Bi­sa­yan word by word and phrase by phrase. The main difficulty is that when the Dutch wrote down the Si­ra­yan language in the 17th century, their own spelling system had not yet been standardized, so they were unable to accurately record the Si­ra­yan pronunciation. It took Ma­ca­pili more than seven years, burning the midnight oil on countless occasions, to complete his Si­raya Glossary: Based on the Gospel of St. Matthew in Formosan (Sin­kan Dialect), a Preliminary Survey, which contains more than 3000 Si­ra­yan vocabulary items. Only later, with this as a starting point, could there be textbooks, illustrated books, pocket books, audiobooks, the training of teachers, and finally the introduction of Si­ra­yan language classes into the formal educational curriculum in 2016. The words and deeds of the older generations of the clan are imprinted indelibly on the children’s hearts. 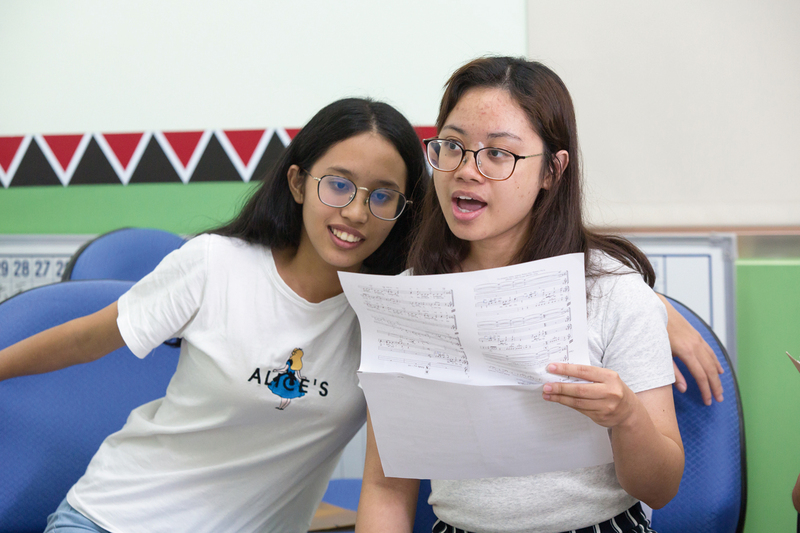 ­Euphony wants to go back to school and study for a degree in linguistics, and she is very interested in the analysis of sentence structure. She is also considering researching the Si­rayan language herself, so that in the future she can help write teaching materials and lesson plans to assist more teachers of the language. Lici says, “I have known my future goal from early childhood: to work to revitalize Si­ra­yan culture.” Even in choosing her university major, she considered what would be of most value to the Si­raya in the future. Today, the Si­raya’s campaign for official recognition as one of Taiwan’s indigenous peoples is still ongoing. To this end, members of the Si­raya community have several times brought administrative lawsuits before the Tai­pei High Administrative Court, demanding that the central government formally recognize their historical status and identity. When Cheng­­-­hiong­ got the news back in Xin­hua, he still tried to fire up his fellow tribespeople, saying that they should go ahead and eat the tang­yuan to celebrate victory in the future. Having not admitted defeat for more than 20 years, Cheng­-­hiong is pledged to the revitalization of Si­ra­yan culture, and has continually advanced toward this goal. He has always believed that the Si­raya will eventually be formally recognized as an indigenous group. The transition to a new generation is inevitable, and the seeds that have been planted in the minds of the newest generation have broken out of the darkness of the soil and into the sunlight. The children and grand­children of the Siraya believe that, like that family portrait, hand in hand they will continue to fearlessly advance on the path to a Siraya renaissance.